Personal log, Stardate 50924.4: I have arrived at my parents home extremely close to the Cardassian Border. Although my parents never fought against the Cardassians, and the System occupation, many abandoned the planet. Unfortunately, the Cardassians' new alliance with the Dominion has resulted in their untimely demise. I have made plans to evacuate my family's belongings. Because of the high threat in the area, I did not come along. I have brought my friend and shipmate, Ensign Sonya Fiehrer, just in case the Jem'Hadar came calling. "There it is," Patrick said. "Let's get everything and get out of here. This isn't a happy homecoming." "I understand, sir." Sonya replied as the pair approached the house. The house was still standing after numerous attacks by the Jem'Hadar, but both knew that might not be the case for long as they entered the door. "I'll locate what I want to get out of here, you determine the coordinates," Patrick told Sonya. Second officer's log, Supplemental: Intrepid is patrolling the Cardassian border on the lookout for Jem'Hadar ships. We've heard about Commander Ingrum's mission to recover his family's heirlooms, and are keeping an eye on him. "Sir," the slightly older ensign said to the young Jenna Carson, "I have a report saying that Hastings has been destroyed." Oh, great, Jenna thought. Although she didn't always get along with Patrick, she had the utmost respect for him and was sorry to hear that the ship he served on was destroyed. "Keep your eyes on our home-salvagers." "Aye, sir," the ensign replied. "That should do it," Patrick said as he beamed the last of the items he wanted to remove onto the runabout. "What is it?" Sonya asked. "It's a late 20th century afghan. The cat portrayed here, Chessie, was a famous icon of the Chesapeake and Ohio railroad." "All right," Sonya replied as she powered up the runabout engines. "Commander, I think you should take a look at this. It looks as if a runabout was downed." Patrick viewed the monitor, "Let's get a visual. Take us to that location." The view of the wreckage was enough to send messages of gloom to anyone's heart. "Sonya, scan for survivors, if there are any, beam them up, and get us out of here." Patrick watched as the two survivors beamed up huddled together. Patrick's heart melted at the sight of two lovers together. "I'm sorry to interrupt your togetherness, but this isn't exactly the best place to have a date." "I have to agree, commander," The young man said, "I'm Lieutenant Bernie Tyler, USS Tian An Men, Roslyn and I were returning from shore leave when we were forced to dodge the Dominion and Cardassians. Unfortunately, our runabout came in the line of fire and we went down." "Unfortunately, the Tian An Men has been lost, but I'll be sure to get the two of you out of here. I'm Commander Patrick Ingrum, welcome aboard the Neosho." "Commander," Sonya said, "I'm reading unusual readings ahead, maybe a cloaked ship." "Continue scanning, and open hailing frequencies just in case." "Something's going on. Looks like a she's decloaking." The group aboard the runabout watched in awe as a Federation starship decloaked in front of their eyes. "The registry reads USS Baldwin, NCC-2013," Roslyn noted. "I'm pulling up Baldwin from the Starfleet Archives," Bernie added. "The only details I have say she was lost 65 years ago in this sector." "It sounds like an early skirmish with the Cardassians" Patrick noted, "Sonya, take us into the shuttle bay. I want to investigate this further. Given Starfleet's ship shortage and the likelihood of full-scale war, they will want to put this ship back into service." "Yes, Sir," Sonya proudly replied. 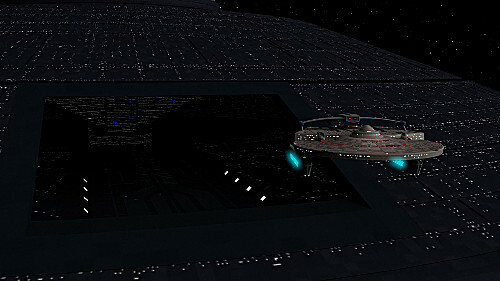 As the runabout approached the ship, Patrick connected the computer systems together. "Looks like we got an atmosphere in most of the ship, but the Bridge systems have been compromised. I say we set up shop in engineering." As soon as they boarded the ship, the crew headed directly to engineering. Although the ship had been hidden, the elderly systems were more or less intact. "It appears that this ship still has good bones," Patrick continued, "but that the main power generators need a jump start. Sonya, transfer power from Neosho" The lights and the main computer came on flawlessly; however, when Patrick checked the sensors, he saw trouble coming. "We've got bandits coming in. Red alert, battle stations," he replied. "I have tactical. Looks like this ship still has its guns. Shields and phasers are online and there are photon torpedoes already in the chamber," Bernie replied. "I have helm control," Sonya said. "The impulse engines are online. I will have warp drive in a few seconds." "Here they come," Roslyn said. The ship rocked with the hit of the Dominion ships. "Direct hit. Shields have no effect," Bernie replied. Bernie directed every ounce of power he had into the phaser array as he fired on the Dominion ships. Even he was surprised at the result, "Direct hit. Major damage to the enemy ships." "Then let's get out of here while we have the opportunity. Set a course for Deep Space Nine, Warp 5." Acting Captain's log, Stardate 50925.2: I have been studying the history of this ship. Some of the details are a little sketchy, but I did find the answer to one big question. "Apparently, Starfleet at the time was still wary of the Cardassians. A secret agreement between Starfleet Intelligence and the Romulans allowed Baldwin to be equipped with a cloaking device." "Similar to the current agreement regarding a cloaking device aboard the Defiant," Admiral Ross noted. "Commander, I am sorry to bring you more bad news, I have received word that the Hastings has been destroyed." "Understood, sir" Patrick answered stoically. "Based on what you've ascertained, it sounds like Baldwin is in good enough shape to be put into service. I'm making the Baldwin yours. Captain, your current orders are simple: get the ship to D.S. Nine for a new bridge module, then proceed to Starbase 212 for a more thorough refit." "Thank you, sir," Patrick replied. Despite having just lost his parents and his former ship to enemy action, he knew that having his own command was a great responsibility, and perhaps the best way to honor his fallen friends and family. "I understand that you weren't on the command track originally. We have several ships that are nearly ready, and they will need new captains. It's at the point where some we might be offering commands to current second officers. I have one such candidate in mind." "I'm all ears," Patrick replied. Admiral Ross continued, "The current second officer of the Intrepidhas been on a command path since she graduated from the academy." "Jenna Carson, I've known her since high school," Patrick replied. "Though I haven't always gotten along with her, I would agree that she has the aptitude to be a fine captain herself." "She's definitely on the shortlist for an eventual command of her own," the Admiral said. "We would like for her to have some time as an XO before we offer her a ship. Would you be willing to take her in, even if it's for a short while?" "I understand that the Intrepid will be at D.S. Nine. I will talk with her when we get there." Captain Benjamin Sisko of station Deep Space Nine anxiously greeted the new captain as Patrick exited the Baldwin, "I'm sorry to hear about your family. Losing a loved one can be something that is hard to bear." "Thank you," Patrick replied, "Considering all that has happened, I'm just a bit overwhelmed, and I have to move forward. I've got to meet an old friend at Quark's"
Sonya came into Quark's bar to get a drink when she noticed a young lady she hadn't seen in a while. "Sonya!" Jenna exclaimed, waving her over to her table. "Hey," Sonya replied as she sat down. "I take it you and Patrick made it back from Aloran relatively unscathed," Jenna replied. "I'd say I got a little more than we bargained for." Patrick interrupted as he approached the table. "I heard about the loss of the Hastings. I don't know if you are the luckiest person or the unluckiest person in the sector, sir," Jenna replied. "By the way, aren't you out of uniform?" she continued, noticing that her friend still wore the three rank pips of a commander. "If joy must be balanced by tragedy, Jen, I suppose that the reverse must be true as well. I didn't come up to see you to argue. You're the second officer of the Intrepid, and both Captain Saavik and Admiral Ross think very highly of you. Now, if a lowely computer tech can get directed into command of a ship, certainly you have potential." "I know what you're trying to say" Jenna replied, "and even though we haven't gotten along all the time, I would still be honored to be your first XO. Now, about your uniform"
"I'm not the only one with an out-of-order uniform," Patrick said with a big grin, "Being my XO means I now get to promote you to Lieutenant Commander." Patrick pulled out two boxes, one containing a gold rank pip, the other containing a black rank pip. "All right, number one. Would you do the honors for me, and I'll do the honors for you?" "Absolutely," Jenna replied. She grabbed the gold pip and placed it into position on Patrick's collar, so that Patrick now bore the proper insignia of a Captain. When she was done, Patrick added the black pip to Jenna's two gold pips, officially promoting her from Lieutenant to Lieutenant Commander. As soon as Patrick and Jenna finished making their new ranks official, Quark, the Ferengi bartender, arrived, "Could I interest the three of you in anything?" "I'd like a root beer please, Quark," Jenna replied. "Three, and I'm buying," Patrick finished. "Three root beers, coming right up," Quark Answered, "And place it on the new captain's tab." Begin Captain's log, Patrick Ingrum, USS Baldwin, Stardate 50932.2: The Intrepid has been sent out to an assignment in system 39J. Meanwhile, the Enterprise has arrived with our new bridge module and crew members. Lieutenant Karen Merrill has spent the past month helping rebuild the Enterprise. Her speciality in ship design and especially her experience with the new Sovereign class made her valuable in the rebuilding. Now, she has learned that she has been transferred to the Baldwin as chief engineer. Although she had met her new captain before, she was still nervous about this new assignment. As she stood on the transport pad, ready for her transfer, Captain Picard walked in. "I'm sorry to interrupt, but I wanted to meet Captain Ingrum myself." "No problem by me, sir," Karen replied as another young lady walked in. "Kay, what are you doing here." "I've been assigned to the Baldwin as well," replied the blue shirted Kay. "our new ship's crew is being put together from scratch." As Kay stepped onto the transporter pad, Captain Picard ordered, "Energize,"
At the other end, in the Baldwin's transporter room, Patrick waited as Captain Picard and his two new crew members beamed aboard. "Welcome aboard the Baldwin, Captain Picard," Patrick said to his fellow captain. "Thank you, and my sincere condolences to you with the loss of your family and of the Hastings," Picard replied. "Thank you, sir," Patrick answered as he turned his attention to Kay, "Welcome aboard, Doctor, now that you finally got your M.D." "And I never thought I'd be serving you on my first assignment," Kay replied. "You never know," Patrick concluded, turning his attention to the engineer, "Karen Merrill, right." "That's right sir," Karen replied as the group left the transporter room. "I know engineering was not your specialty in the academy, but I think your expertise on starship design, and the experience you gained aboard Enterprise makes you well-suited to the job at hand," Patrick said, entering a turbolift, "Engineering." He paused while the turbolift began to move. "After all, I was far from a command-track cadet myself, but fate and the COs I served under had other ideas." In engineering, Data and Geordi LaForge were working on installing an updated cloaking device when Patrick and his crew walked in. "She's almost ready, Captain," Geordi said to Patrick. "What is it?" Karen asked. "It's a prototype phase-cloak device," Patrick replied. "The situation with the emergence of Baldwin caused the Romulans to re-negotiate with Starfleet. Basically, it was determined that the section of the Treaty of Algeron dealing with cloaking devices should be retroactively disallowed. Since Starfleet had yet to destroy this device, discovered by the Enterprise-D three years ago, we've decided to run further tests." Patrick couldn't keep the inside humor any longer and forced a giggle, "They had to compensate Admiral Pressman for his troubles." Captain Sisko walked into the room, "I'm sorry to interrupt, but I have new orders for the Baldwin. We have detected a unidentifiable ship adrift about 5 light-years away. Since you're heading that direction, Starfleet has requested that you stop and investigate on the way." Another girl walked in. "The Bridge is ready when you are, captain, if you will come with me," she said to Patrick, smiling. "Thank you, Jaimie," Patrick replied as he followed her up to the bridge. No sooner than Patrick arrived at the bridge then Jenna had a report, "Our friends have departed, and D.S. Nine is clearing us for departure." "Seal the Airlock, and release docking clamps." "Docking Clamps Released," Sonya replied. Patrick sat down at the vacant helm position, as the Baldwin did not have a full crew just yet. "Setting course for the unidentified ship, warp five. Engage cloak on my mark." "Cloaking device ready, sir." Jaimie replied. Patrick calmly sat in the captain's chair, almost bored out. "Karen," he said in the intercom, "how's it going down there?" "For being grossly under staffed, I'd say we're on the right track. You can safely proceed to warp six." "Sonya," Patrick replied, "you heard the lady,"
"Aye, sir, warp six," Sonya replied. After Patrick set course, he turned the helm over to Sonya, who was jumping between the helm and the operations console. Captain's log, Stardate Stardate 50935.8: We've discovered that the unidentified ship was an old DY-200 class ship that disappeared in the very early 21st century. I am leading a away team to investigate. "Are you sure I can't convince you to stay here. You are the captain, after all," Jenna said to Patrick. "Jen, trust me on this one. I am the only one aboard this ship that even remotely knows anything about 20th century Ear— "
"I thought we agreed on 21st Century." "2004 is a little to early to find info on the 21st century. Most of the stuff is probably from the latter part of the 20th." "All right, but come back safely. I'm sure I will get my own command. I don't want to inherit a command from a friend." "I will number one." In addition to the captain, Bernie and Roslyn were picked for this assignment, mainly because they were the only ones Patrick could spare, "Energize when ready, Jenna," Patrick said as he stepped on the transporter pad. As soon as the away team beamed over to the old ship, Patrick noticed something wrong, "That's strange, this ship was designed to hold a crew in stasis. It looks like someone has modified the ship." "Captain," Roslyn said, "what are these?" "Looks like optical disks," Patrick replied, "They were a means of storage of audio and data." "Microfilm and microfiche," Patrick replied, "They contain copies of paper documents." "It's like a floating time capsule," Bernie commented. "Yeah, but why one of their most advanced ships of the time," Roslyn added. "You have me there," Patrick Replied, "Ingrum to Engineering,"
"What is it, captain," Karen replied. "Is it possible to tractor this ship at warp,"
"We could, but it'll be slow going. I can get you to warp 5 without losing her." "Then prepare for it as soon as we get off this ship. Ingrum to Carson, thankfully, there's nothing over here that's dangerous. We can tow her with us and study her more when we get to Starbase. Three to beam out." Captain's log, Stardate 50938.4: We have arrived at Starbase 211 for further refits, rest, and new crew members. The threat of war was the only thing on his mind as he exited the turbolift toward engineering, "Karen, how long is it going to take to redo the shield matrix." In Starfleet's first encounter with the Jem'Hadar, they were able to penetrate the shields of a capital ship and eventually destroy it with ease. Now, the shields have been reconfigured to defend against the Jem'Hadar 'warbugs;' however, despite being in relatively good condition for being lost for over 60 years, the new shield configuration was vastly different. "It may be a while captain." "I'm pulling for the end of the week. We've got a lot of work ahead of us." "Make that your main priority. I've heard scuttlebutt that we may be going to war soon." Her jet-black hair flowing in the wind, Roslyn picked the perfect place in the grove along the pond to lay her blanket down. She wanted some simple time without worrying about the oncoming storm. She was looking for some time with her mate, and he was apparently running behind. "Hey," Bernie said from behind. "Where have you been," Roslyn replied. "I just got here," he answered, reaching around his girlfriend's waist and slowly reaching for a kiss. "I had to stay a couple of extra minutes. You of all people could appreciate that." "I know," Roslyn replied. "I just didn't want our little picnic lunch to get spoiled." "Assuming that came out of the replicator, I find it hard to believe that it would be so easy to spoil," Bernie stated as he looked into her blue eyes. "We've pretty much got a week in port. After that, who knows what's going to happen next." Jenna entered the office with another young lady, "Captain, this is Lieutenant Reinette Hernandez, the young lady you picked for second officer." "Welcome, Reinette," Patrick said, quickly turning to the matter at hand, "Five days ago, I received a message from Admiral Ross. Once we leave space dock, we are to join a Federation-Klingon task force to attack a Dominion shipyard on Torros III. This is very important, I want us to make sure this ship is at maximum state of readiness, and that we are acquainted with everyone that will call her home. This is an old ship with a young crew, but I think she can be a bright gem in this dark hour of war." "We should be ready to leave tomorrow," Reinette noted. "I have to agree with her," Jenna replied, "but I'm not sure about the crew. They have never been in battle, and like they say 'war is hell.'" "Between the attack on Aloran and the loss of the Hastings, I think I understand that all too well, Jenna. I've had these five days to grieve and to contemplate, but I know I'm going to have to move on, and do so quickly. I don't have much say in where we go from here and when we fight. All I can do is hope for the best when the time comes." Captain's log, Stardate 50954.4: Baldwin is ready to leave space dock, but I don't know how the crew will react to an actual combat situation. Unfortunately, there is only one way to find out. "Kim, are you ready to take her out," Patrick said to the new helm officer. "Spacedock has cleared us for departure," Sonya said. "That's our cue, Miss Baker. Aft Thrusters to one-quarter,"
"One-quarter, aye captain," Kim replied. As the Baldwin slowly exited the space dock of Starbase 211, Patrick pondered the task at hand. "Kim, set course bearing 211 mark 36, warp four," he finished as the ship cleared the door. The crew talked about the mission at hand, previous missions, and old times at the academy. Patrick thought it was a good idea, that morale is needed more than ever at a time like this as he turned to Jenna, "How are you?" "So is everyone else, don't worry about it — yet." The crew on the bridge were amazed by how many starships were devoted to this strike force. The Galaxy, the Venture, and the Lakota were here, along with many others, "There's more ships here than at Wolf 359," Sonya remarked, referring to the massacre by the Borg nearly seven years ago. "Incoming message from Admiral Ross, captain," Jaimie said. "Let's see it," Patrick replied. Admiral Ross's face greeted the monitor. "You're late," he said, "We expected you two hours ago,"
"Sorry, the reconfiguration of the shields took longer than expected," Patrick answered before adding a little joke of his own. "I did not want to be cannon fodder on my first mission." Without missing a beat, the Admiral simply continued with his instructions. "Turn hard to starboard and hold your position. Current reports from General Martok indicate that the Dominion fleet has not yet reached the border"
Hours passed as the crew of the Baldwin waited, The silence broke as Jaimie delivered the message, "Captain, incoming message from Admiral Ross, It's time." "Kim, you know what to do." Captain's log, Stardate 50961.8: Our task force has entered Cardassian space. Our mission: take out the Torros III shipyards while the Dominion fleet is busy elsewhere. "How is it going up there," Patrick said to the lady at tactical, trying to break the silence. "Just fine, sir," she replied. "Captain, we have entered the Torros system," Roslyn said. "Take us out of warp," Patrick replied, "Red Alert, all hands to battle stations. Stand by for further orders." "All ships," Admiral Ross said over the subspace radio, "We're not seeing any ships, so go directly for the defense systems." "Like the Admiral said, go for the shipyard's main guns"
"Target acquired," the tactical officer replied. "Ross to Baldwin, could you take care of that." "Setting course for enemy ship," Roslyn immediately replied. "Sir, the ship is heading straight for us," Bernie noted. Before Patrick could react, two Jem'Hadar solders beamed onto the bridge, "Nobody move," one of them said as the other reached for Roslyn. "No," Bernie said as he tried to reach his girlfriend, but to no avail. The soldier aimed his weapon at him and the unarmed Bernie did not try to resist as the solders beamed off with their capture in hand. "Bernie, keep track of that ship, and get me Admiral Ross in my office." Admiral Ross's image appeared in Patrick's holo-communicator, "What happened?" "The Dominion's target was one of my crew members, Roslyn. They beamed in, took her, and beamed out. Kidnapping seems a bit out of place with the Dominion." "I was afraid of that," he replied. "There is something you should know about her. Meet me aboard the Galaxy in one hour for a debriefing." "Admiral, I'd like to bring someone along with me," Patrick answered. Since Bernie and Roslyn were close, he thought that having Bernie would bring additional insight on Roslyn. "Lieutenant Tyler is also welcome to join this meeting. What I have to say isn't classified, but out of respect for Roslyn's privacy, isn't widely disseminated." Pulses of orange-yellow energy raced out of Baldwin's main guns. "Target neutralized," noted the tactical officer. "Move on to the next target." "Captain, I'm detecting a Dominion ship approaching," Bernie interrupted. The rest of the fleet noticed the incoming ship as well. "Ross to Baldwin," the Admiral messaged, "could you take care of the incoming fighter?" "The warbug's objective was not to attack my ship, but to take one of my crew members, Roslyn. It was a quick beam-in and beam-out. Not only I'm I upset about losing another crewmate, but I find it very peculiar. Kidnapping seems a bit out of place with the Dominion." "I was afraid that Miss Roslyn might be targeted. There is something you should know about her that is not in her personnel file. Meet me aboard the Galaxy in one hour for a briefing. It's best if I tell you in person." "I agree, Lieutenant Tyler should also be briefed. What I have to say isn't classified, but it is something that Roslyn would consider a private matter. I wouldn't know if she already told him. If she hasn't, I hope both of them would understand why it has to come out this way." Captain's log, Stardate 50963.7: The Dominion's actions have broken a couple apart. Based on what Starfleet has learned about the Dominion, kidnapping is not their normal modus operandi, which makes me curious as to why the Jem'Hadar specifically came for one person. Patrick and Bernie entered Admiral Ross's office with only one question on their minds. "What is so important about Roslyn that the Dominion is willing to take her alive?" "I'm just going to get to the point," the Admiral stated. "Roslyn is an Augment who defected from the Cardassians seven years ago. She told Starfleet Intelligence that her DNA was coded 'from scratch' by Dr Alan Murrow. From what we can tell, Dr. Murrow was hired by the Cardassians to create genetically enhanced humans in order to infiltrate the Federation." "If Roslyn was allowed to serve in Starfleet, I have to assume that Roslyn was forthcoming about her genetic heritage, and that she must have had a full psychological evaluation." Patrick commented. "Starfleet Intelligence questioned her very throughly," Admiral Ross replied. "They determined she was not a threat, and the head of the team that wrote the report on Roslyn actually encouraged her to attend Starfleet Academy and sponsored her." "She never mentioned this to me, and I was her closest confidant on the Tien An Men," Bernie added, "Honestly, I'm a little upset she never shared this with me, but I also understand why she wanted to keep the fact she was genetically engineered close to her vest. I think she wanted people to judge her on her own merits, and not let her augmented DNA cloud peoples' judgement. To be honest, knowing this doesn't change the way I feel about her. She is still the most amazing woman I have ever met. I love her unconditionally." "I wouldn't consider myself an expert on women by any means, but I think you've said the three words Roslyn needs to hear when we rescue her," Patrick commented. "I've lost part of my family and many shipmates recently, I'm sure as hell not going to lose someone on my first assignment in the center seat. The Baldwin has a cloaking device, I'd say this is the kind of op where it might come in handy." Flanked by two Jem'Hadar solders, Roslyn was forced into the center of the village. "What is this all about?" A man in a blue shirt appeared, and Roslyn knew who he was, "Shouldn't it be obvious to you, number six?" "I am not a number, I am my own person," Roslyn replied, "and my name is Roslyn." "Ah, so I've heard," Dr. Murrow replied, "'beautiful rose,' the name definitely fits you." "Anyway, young lady, I can't have you around collaborating against the people I work for. Either you will work for us, or I will make sure that you never leave." "That shouldn't be a hard choice," Roslyn replied. "I thought you would say that. Take her away"
Patrick and Bernie entered the bridge of the Baldwin, determined to get Roslyn back, "Sonya," Patrick asked, "did you track the Dominion ship?" "Yes, sir," Sonya replied. "It stopped in orbit around Torros II when the fleet headed back to Federation space." "Kim, we're going back to the Torros system, best possible speed." "Jaimie, prepare to engage the cloak." "Kim, I need you to stand watch on the bridge for a few minutes. I'll explain everything to you after I debrief the rest of the senior staff. Let me know if you see any warbugs. The rest of you, please join me in the conference room." As soon as the bridge crew was assembled in the conference lounge, Bernie went straight to the point. "Roslyn's 'father,' for lack of a better term, is an agent for the Cardassians." Bernie started as he debriefed the staff on what he had learned about his girlfriend. "Based on what Roslyn told Starfleet Intelligence seven years ago," Patrick continued, "he created seven augment women, all of whom are in their late twenties to early thirties. He may or may not have created more since Roslyn defected; however, although their augmented DNA allowed the first seven sisters to mature a little faster physically and mentally, any additional creations would still be in the early to middle part of their adolescence." "What does that mean for the Federation?" Reinette asked. "I don't know," Patrick replied. "The Founders have shown they are more than capable of subterfuge on their own, and it will still take time to integrate the Dominion's genetic engineering with Dr. Murrow's knowledge of the human genome. If they do, the potential damage they could cause could wind up being immeasurable." "Our mission," Bernie finished, "is to seize him at all costs. We cannot let Dr. Murrow's knowledge of the human genome stay in enemy hands, which is why Admiral Ross has authorized this mission. It is also our best opportunity to get Roslyn back. That is the personal mission of the captain and myself." "You said Dr. Murrow has already created seven women. What do we do about Roslyn's sisters?" "That's something we'll have figure out on the fly," Patrick replied. "They could be a possible enemy, or a possible ally." Roslyn sat in her cell when a young lady approached her cell. She was identical to Roslyn in almost every aspect, "Seven," Roslyn called to her baby sister. "It's me, Roz. Listen to me, escape is going to be unlikely. From what I hear, you're going to be target practice for the Jem'Hadar until they finally kill you. Of course, they've never gone up against someone as feisty as you. I'm hoping you can clean their clocks, and if there's anything I can do to give you an advantage, I will take it." Captain's log, Stardate 50963.8: The Hood has been assigned to patrol the Cardassian border, but we have run into problems of our own. Our systems are intermittent and help is far off. Captain Robert DeSoto had served the last 15 years as captain of the Hood, but he has never been in such a tight situation. "Do you have any advice, Number One." "Sorry, captain," the first officer replied. The second officer stepped in, "Ensign, what was the last report on the Baldwin?" "According to their flight plan, they should be near Torros II about now," The ensign said as his console beeped, "Enemy ships approaching." "Red Alert, all hands to battle stations," he turned to the second officer, "Any advice on this one, Kelly." "Send a distress signal," the first officer stepped in. "Agreed, helm, get us out of here." "Ready photon torpedoes," Kelly said, "I don't want to take any chances." "Sir," Jaimie said to the captain, "there's an incoming distress call from the Hood,"
"Is there anyone closer," Patrick replied. "The Baldwin does not have to remain in orbit to fulfill the mission, but the distress call makes things that more complicated. Jenna, as soon as we've beamed down, take care of the Hood." "Bernie, meet me in transporter room two." Patrick met Bernie in the transporter room, "Are you ready." "I don't think anyone is every truly ready for a combat mission," Bernie commented, "but I'm as ready as I'll ever be. Don't you think we need greater numbers?" "Based on our scans, there's maybe 15 Jem'Hadar on the planet at most." Patrick noted as they stepped onto the tranporter pad, "Miss Elias, have you found a beam-down point." "Yes, sir. Like you said, this planet only contains one tiny village just inside the northern hemisphere. I'll beam you down about 2 kilometers to the west." Once the transport was completed, Kristy reported back to Jenna. "They're down there, Commander." "Thank you, transporter room. Kim, set course for the Hood, maximum warp." "So, you have someone out there," number seven said. "That's right," Roslyn replied from her cell, "And I'm almost sure he will try to come for me. If he doesn't, my commanding officer has lost friends and family recently, he doesn't want to lose anyone on his first mission." "I don't know about that," the unnamed twin replied. "Finding out that you concealed something this big from them could cause him not to trust you." "There's one other thing. Dr. Murrow is a high value target for Starfleet. Getting the opportunity to capture him would be a big deal. Even if they didn't want me, Starfleet knows where he is now; they would send somebody to try and take him prisoner." "If they do, I'll do what I can to help them." "Don't mention it. Also, you did a great job against that Jem'Hadar solider. You make all of us —"
Before she could finish, a siren blared. "Number seven to the town center," Dr. Murrow's voice boomed. "Gotta go," number seven said to her sister. "Well, well, well," the doctor said to his unexpected company. "Trying to spring the girl," he coolly said with a phaser aimed at him. "We were planning on ransacking the place, but we would settle for taking her home and taking you prisoner." "Such a bold statement for a young starship captain. I'm afraid that you are outnumbered," he said as a dozen Jem'Hadar solders surrounded Patrick. As Patrick surrendered his phaser, he through in a barb of his own, "I knew the odds when I beamed down here. I'm still not spooked." The Baldwin arrived to find a ship half-adrift in territory of an enemy not known for asking questions. "Bridge to transporter room," Jenna communicated. "Kristy, work on transporting a repair team." Patrick and Bernie saw number seven as she approached the center of the village, "Is that Roslyn?" Patrick asked. "I don't think so," Bernie replied, "She looks like her, though." "Number Seven, take these prisoners away," Dr. Murrow instructed. Number Seven, appearing to follow the doctor's instructions, approached Patrick and Bernie. "Follow me," she told them. Before taking another step, she approached the Jem'Hadar solider with the phaser and kicked him in the chest, forcing the phaser out of his hand. "Heads up," she said to Bernie. Bernie promptly made the flying catch of the phaser. Noticing Dr. Murrow trying to escape, he fired the phaser at him. He was stunned, he'll recover eventually, but there were others to take care off. Number Seven demonstrated her lethal strength as she grabbed a solider by the head and twisted it sharply to the right. Admiral Ross was right, Patrick thought as he grabbed the other phaser and pointed it at another solider. Between the young woman's kicks and well-coordinated phaser fire, all of the Jem'Hadar soldiers were disposed of. Once they were finished, Number Seven nodded toward the away team, "You must be Captain Ingrum and Lieutenant Tyler. Follow me, please." "Where are you taking us?" Bernie replied. "I'm taking you to Roslyn's holding cell," Number Seven replied. "Captain DeSoto, welcome aboard the Baldwin," Jenna said as the Captain from the Hood entered the bridge. "Thank you, commander," he said. "We should be ready in a few hours; can you stay nearby in case we need you." "We need to check back in at Torros II, but we'll stay within an hour of you in case anything happens," Jenna replied. Kay pulled out the dermal regenerator as she pointed toward the cut on Kelly's head, "So what happened?" she asked. "We were half down and attempting to escape when a Dominion warship fired on us. We manage to get a volley of photons out and take them out, but lost a lot of good people." Jaimie walked in, "Kelly, how are you doing?" "Just fine, Jaimie," she replied. "Your sister just has a few scratches here and there," Kay commented. "Though you may want to make your sisterly conversation quick. I understand we'll be returning to the Torors system soon." Among the bodies of dead Jem'Hadar solders, Patrick, Bernie, Roslyn, and Number Seven returned to the center of the village before their prisoner woke up from his phaser-induced nap. "Before I forget," Bernie noted to his girlfriend. "I think I need to tell you I forgive you for keeping this secret, and now that it's out, I want you to know I love you." Roslyn placed her arms around her love and proceeded to give him a very passionate kiss. "I told you, three words she needed to hear." "Are you some sort of expert on women, Captain?" Number Seven inquired. "Not by a long shot. What I do know about women I learned by growing up with a younger sister." "Since you have achieved your objectives of capturing Dr. Murrow and rescuing my older sister, where does that leave me?" "Based on your actions in helping us, I'd say we have an ally," Patrick commented. "We would like for you to join us. I recently lost part of my family, having you and Roslyn together would be the closest thing to bringing a family back together." Patrick pause as he was trying to figure out what to call her besides 'Roslyn's sister.' "You know, I don't think I know your name." "I've always been known as 'number seven'," she replied. "I used to be 'number six,'" Roslyn continued, "I'm older, but just by a few minutes. We look similar at first glance, but we are not identical twins." "Well then, I think it's time you picked a proper name for yourself," Patrick said as he handed her a PADD and pulled up a 'Baby Names' app. "This is a list of female names and their meanings." Number Seven looked over the PADD for a few minutes, then made a choice, "You know, for some reason, 'Bridget' catches my eye." "That sounds like a beautiful name, for a strong girl like you. Bridget it shall be." Patrick replied as his communicator beeped. "What was that?" Bridget asked. "My communicator," Patrick replied as he tapped his combadge, "Just in time, number one." "What's your status," Jenna replied. "All of the Jem'Hadar have been killed, we have capturee Dr. Murrow, rescued Roslyn, and picked up a new ally. We have five to beam up." Captain's log, Stardate 50966.3: The missions in the Torros system were a success, but on the other hand, the Dominion has captured Deep Space Nine, which they are referring to by its old Cardassian designation of Terok Nor. Even though the Dominion now holds the station, mining the wormhole was sucessful, meaning that reinforcements from the Gamma Quadrant won't be coming through anytime soon. More importantly, I believe, we have taken out a potential avenue the Dominion could use against us, and reunited two sisters as well. "And this is one of your favorite holodeck programs?" Bridget asked her twin. "I can see why," Bridget responded as she wiggled her toes into the grass. Being stuck on one planet for 25 years made her excited about being on a starship, "So, what will happen to me?" "Maybe I can answer that question," Patrick responded, strolling through the grove toward the twins. "I just got off the line with Admiral Ross. Starfleet will want you to undergo a psychological evaluation, but the Admiral agrees with me that you are a friend and not a foe. After the Psych Eval, what you do next is your decision." Bridget's green eyes told Patrick all he needed to know, "That's what I thought," he replied as he had a seat in the fresh grass. "Welcome aboard the USS Baldwin." Kelly leaned back in the right-hand seat on the bridge, her bright eyes set onto her sister. Jaimie sheepishly smiled back as she calmly manned the tactical station. The Baldwin was out of the fighting — for now — and everyone could enjoy the moment. "Hi, guys," Patrick said. "How are you doing,"
"Just fine, captain," Kelly said. "And Captain DeSoto is sorry for having you tow us in. We concentrated on our weapons, the warp drive is still off line." "That's all right," Patrick replied as he headed for his ready room. "Computer," he said, "Connect to Starbase 42, Lieutenant Anna Elizabeth Ingrum." "Hello," said the young lady at the other end. "Hi, Sis, how are you holding up." "Obviously, everyone here is worried about the Dominion, now that we are officially at war. Everyone here on the Starbase offers their condolences for the loss of our parents. I'm sorry to hear about the Hastings." "So," Anna said, "What happened with the attack on Torros III,"
"Well," Patrick replied, "Since the Dominion was focused on the wormhole, we did not face any stiff opposition. We were able to overcome the shipyard's defenses and set back ship production with minimal losses. The wormhole was successfully mined." "So, can you tell me about your first assignment as a starship captain?" "Where do I start," Patrick noted as he began to recount the mission to his little sister. He knew that moments like this might not happen again. There is no guarantee that anyone will make it out of this war alive. "Actually, the biggest thing I can say that I didn't lose anyone. In fact, I may have gained a new friend." USS Baldwin, it's stories and characters, are the work Richie Kennedy. This story may not be reproduced or duplicated, in whole or in part, without the express written permission of the author. This story is a work of "fan-fiction." Star Trek is the property of Paramount Pictures and CBS Television. This story is for entertainment purposes only and no profit was made off it by the author.